... or when it's something that just kind of sticks out... something that doesn't match the rest of the background... my first reaction is to say "Huh!" When I hear myself saying that, I find myself growing curious. 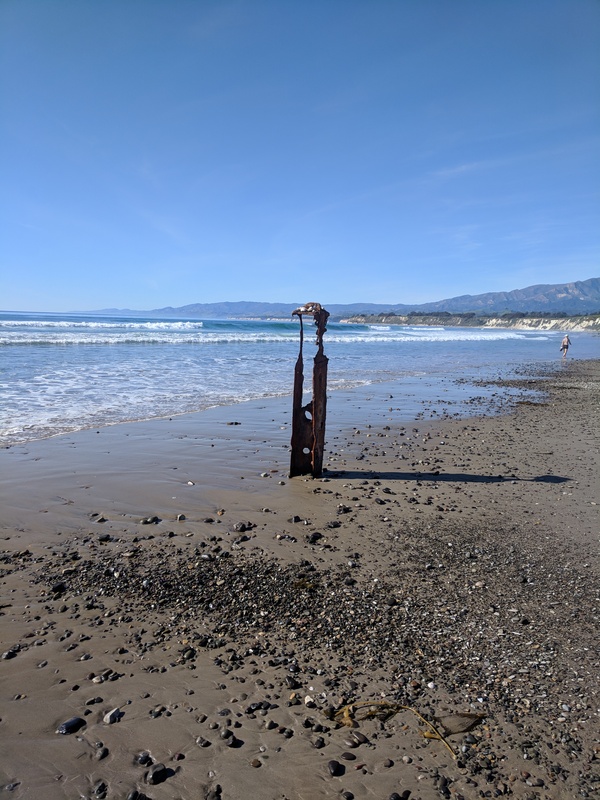 What's the story ... behind these two pieces of steel sticking up out of the beach sand? Link to the original photo (#1) - About 2.4 meters tall. Link to the original photo (#2) - About 2m tall and 100m north of #1. Why that step? Because you often learn a lot about a location by just looking around on a map of the area. And, amazingly enough, my drop pin (the red pin in the map above) is right next to something that's labeled Steel beam. You've GOT to be kidding me! I find this strange chunk of steel sticking out of the sand and it's on the map?? Even more amazingly, there are reviews of the Steel Beam (but as you'll quick figure out, the reviews are for the beach, not the beam, although people do take photos of the beam and paste them in their reviews). I took note of the name of the nearby point ("Coal Oil Point") and the presence of two large oil tanks (the white circles near the center), and the place names "Devereux Lagoon" and "Ellwood Mesa." "Extensive oil and gas operations occurred along the City’s Ellwood coastline during the early and mid-20th century. When these operations ceased, the infrastructure created to support the operations were not properly abandoned. 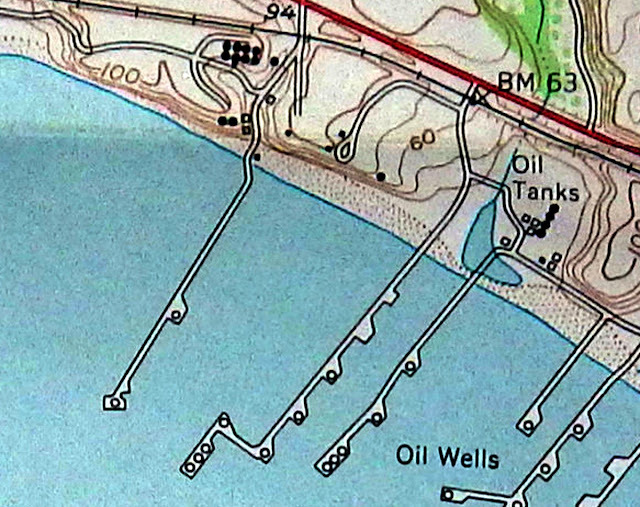 As a result, the Ellwood coastline is littered with remnant oil and gas operations hazards. These hazards include protruding wellheads and well casings, wood and steel piles, pipelines, and wood beams and structures..."
Three things from this: (1) this location is historically known as the "Ellwood coastline." That's useful to know. (2) there were a lot of oil and gas operations here. 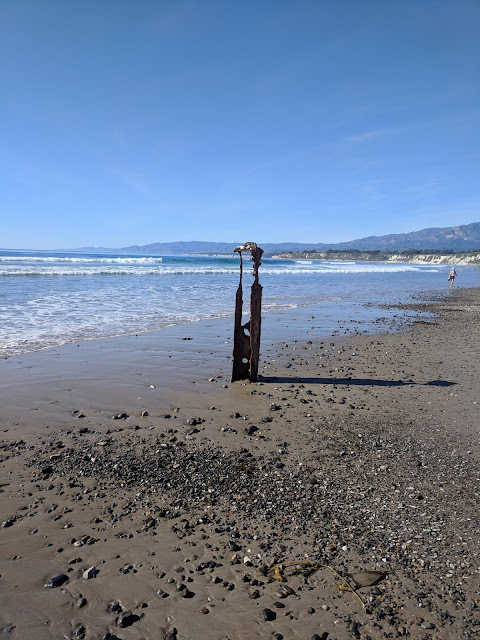 (3) there are probably still steel piles left on the beach. 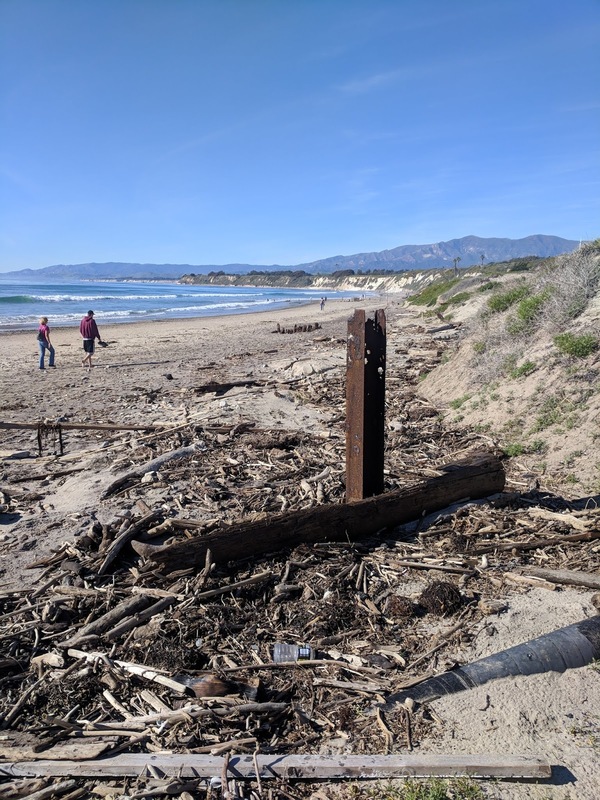 As the report also says, "Remnant hazards include protruding wellheads and well casings, wood and steel piles, H piles and H beams..." So now we know more useful terms: "H beam" and "H pile." So now we know a bit about the what of these beams. They're clearly leftover structural steel from the piers and oil gear that was here earlier. The oil companies didn't do a great cleanup job, mostly just abandoning tons of gear in place. 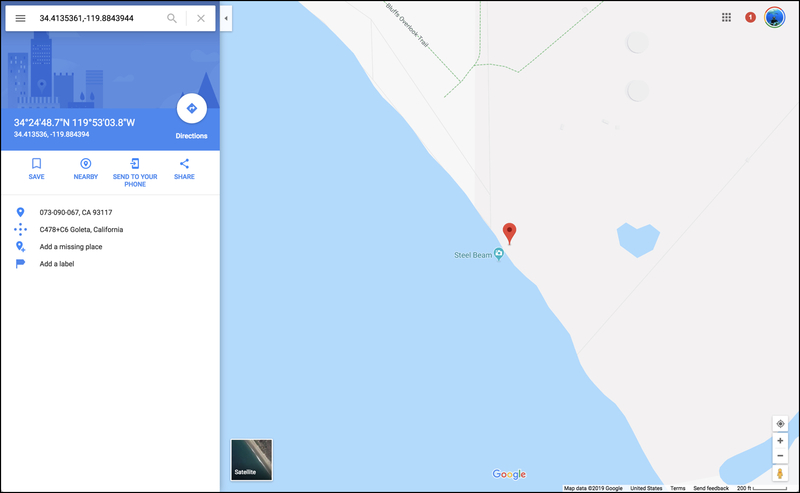 Another result: http://goletahistory.com/haskells-beach/ gives an extensive history of this beach (variously called "Steel Beam Beach" "Haskell's Beach" or "Coal Oil Point Beach," depending on the source. A key illustration in that website is the USGS map of the area from 1951 showing a LOT of oil industry piers and buildings. It's pretty clear what happened. These beams are leftovers from the extensive oil industry piers and oil wells that once dominated the area. That's interesting, but not much of a story. Is there anything else going on here? Just reading this is astounding. 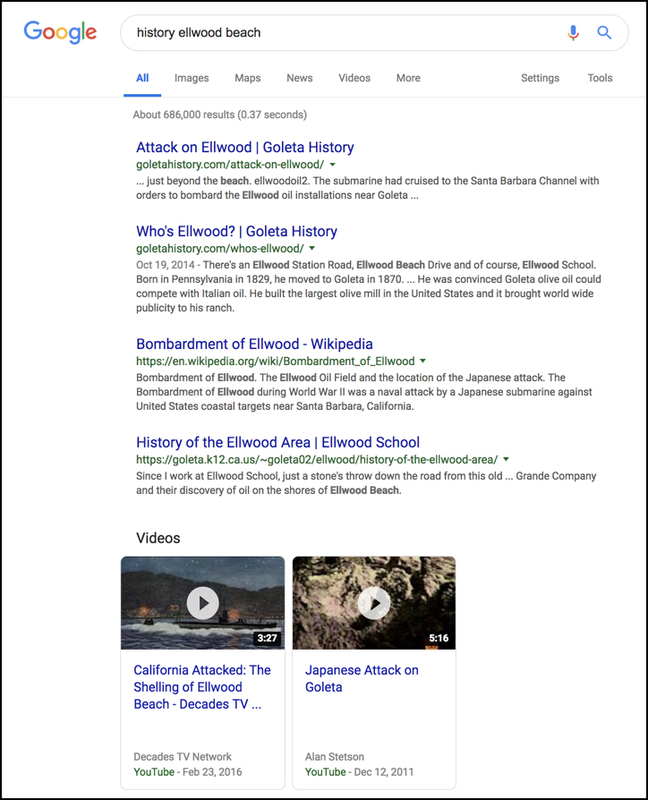 "Attack on Ellwood"? "Bombardment of Ellwood"? What happened here? I did a bit of lateral browsing to open several tabs in parallel on the topics. I was looking for a diverse set of sources (and not the same story told over and over again) on history of Ellwood beach, the oil business, and the attack of a Japanese submarine during WW2. http://goletahistory.com/attack-on-ellwood/ which has the dates, events, and history of the attack (February 23, 1942). This also led to the Bombardment of Ellwood Wikipedia story, with a bit more colorful details. But the bottom line is this..
TL;DR version: Early in World War II, the I-17, a Japanese submarine that was 365 feet long, surfaced outside the oil complex at sunset and lobbed roughly 17 shells at the Ellwood oil complex. There was only minor damage: one derrick and a pump house were destroyed, but little else happened. The oil tanks that were the targets escaped without damage. Of course, for a story this striking, you want to get a bit of confirmation. 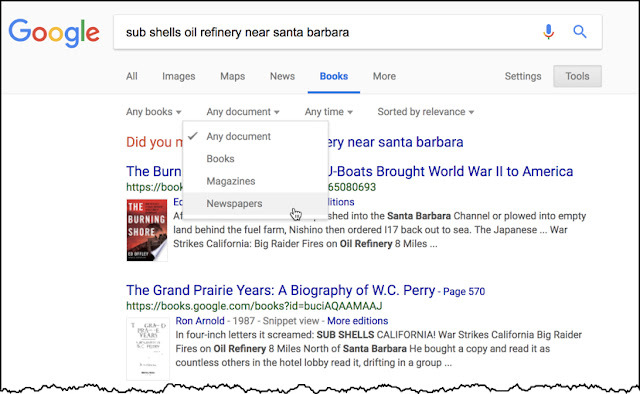 I did a search on Google Books, and switched to the Newspapers mode of Google Books. Yes, that's right: Archival Newspapers are now a part of Google Books! To search on Newspapers, click on the Tools button on the right, then select Newspapers to search just the archival news. Interestingly, the sub’s captain: “…. as a naval reserve officer, Nishino had commanded a pre-war merchant ship that sailed through the Santa Barbara Channel. His ship had once stopped at the Ellwood Oil Field to take on a cargo of oil.” So he knew the place. This kind of astounding. I knew there had been a few attacks, but I didn't know one had happened at "Steel Beam Beach." Much more damage was done by an panic reaction to a weather balloon than was ever done by the actual shelling on the beach. "Probably much of the confusion came from the fact that anti-aircraft shell bursts, caught by the searchlights, were themselves mistaken for enemy planes. 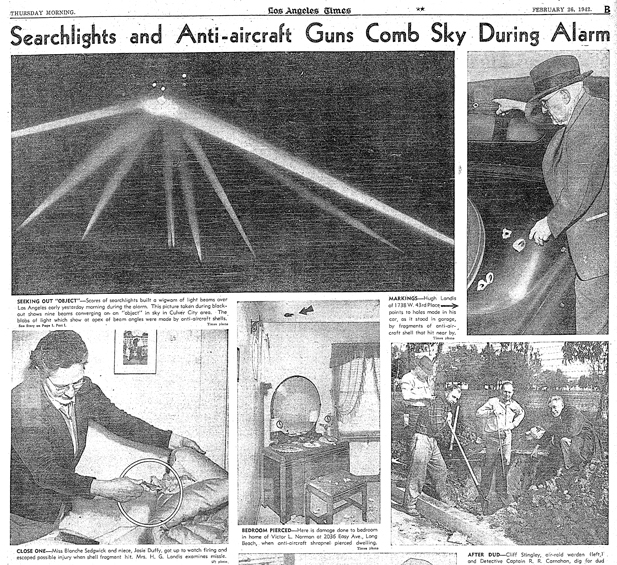 In any case, the next three hours produced some of the most imaginative reporting of the war: "swarms" of planes (or, sometimes, balloons) of all possible sizes, numbering from one to several hundred, traveling at altitudes which ranged from a few thousand feet to more than 20,000 and flying at speeds which were said to have varied from "very slow" to over 200 miles per hour, were observed to parade across the skies. These mysterious forces dropped no bombs and, despite the fact that 1,440 rounds of anti-aircraft ammunition were directed against them, suffered no losses. There were reports, to be sure, that four enemy planes had been shot down, and one was supposed to have landed in flames at a Hollywood intersection." The steel beams are leftovers from a large oil complex, including multiple piers, oil tanks, pipelines, and production gear. This complex was shelled during the early part of WW2 by a Japanese submarine, leaving minor damage behind. But the next day, the shelling caused an enormous panic in a war-jittery Los Angeles, leading to an immense fire fight... with an imaginary opponent, leaving several people dead, and immense amounts of property damage. I have a few insights from this week's Challenge. 2. Checking maps often leads to insights. 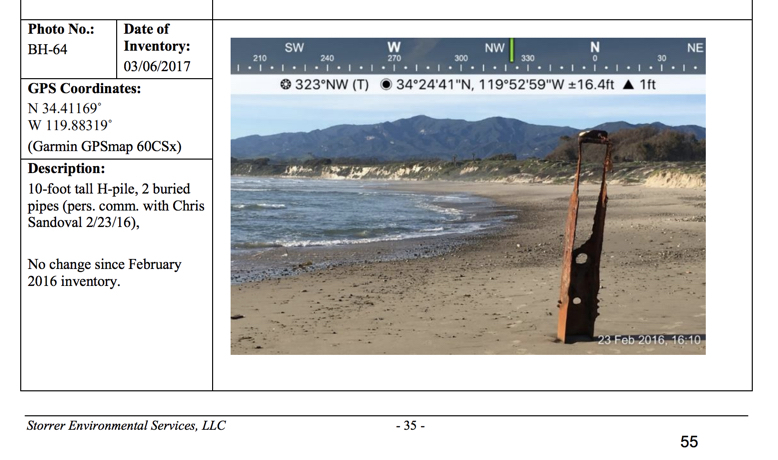 Much to my surprise, the steel beam I found on the beach was marked on the map. I completely didn't expect that! What's more--I learned a lot of local place names (Ellwood, Coal Oil Point, etc.) that proved useful in later searches. 3. Local governments are a great source of information about a place. 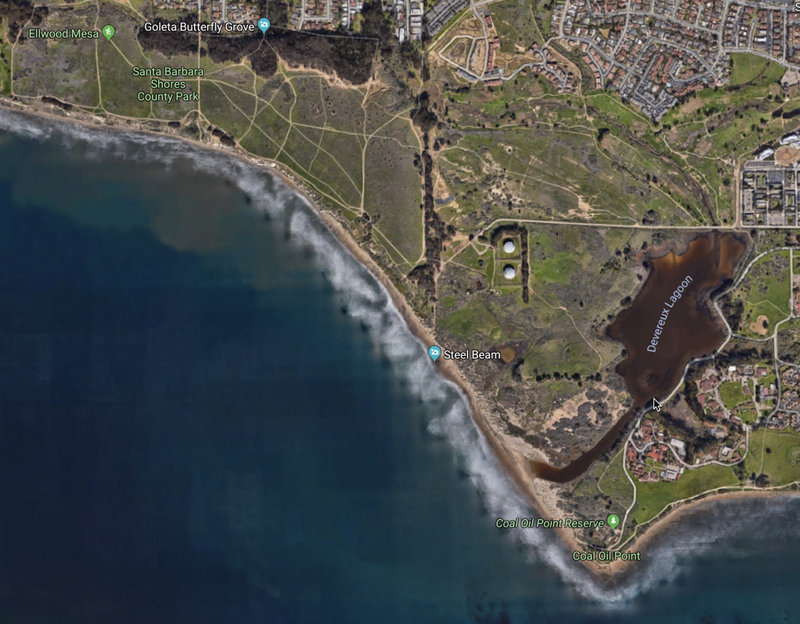 Even though the document was about "beach cleanup," the Goleta city plan for cleanup also gave us a lot of historical information. It's a great place to find context for things like this. 4. 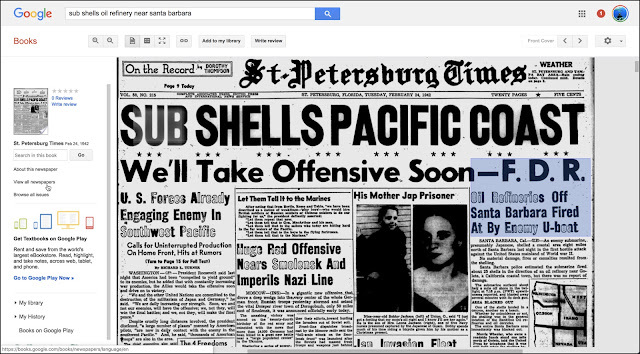 You can find archival newspapers through Google Books. In the past, the News Archive was a separate product. Now it's part of Google Books, and easily searchable once again. Whenever you do history searches, remember to check this out first. It's very easy, free, and handy. We'll talk more about finding the backstory (and what it means to find these kinds of connections). I hope you enjoyed this first in the "What's the story?" series. If you enjoyed this, let me know, and we'll do more like this. Interesting about the steel beam on the map. I thought that might have been your editing the map didn't follow it up. Big mistake and repeat lesson for me: do not assume anything - that way you are less likely to miss something. Loved the idea of this series! Please keep them up. • Standard American Beams – Also known as Junior Beams, S Beam, or I Beams have tapered flanges for increased strength of the flanges. • Wide Flange Steel Beams - Also known as W Beams or H Beams have non-tapered flanges that are wider than the standard S or I beams. Hi Dr. Russell and everyone. I like the idea of this new Series. I couldn't work on it but keep reading the answer and comments of all of you. California Attacked: The Shelling of Ellwood Beach - Decades TV Network Shows theories and Historical marker. Monument to the Bombardment of Ellwood. The first attack on the continental U.S. during WWII occurred off the coast of a quiet California golf course.